Extinct through war or spectacular accident. By devastating pandemic, super-natural disaster, or cosmic cataclysm. Passed through the Singularity to become unrecognisably posthuman, and left the natural order forever behind. Infected by a virus, hijacked by a parasite or otherwise co-opted to become ex-human – a “bio zombie” – moved sideways to a new position as ecological actor. Gently absorbed into – or completely overshadowed by the unfathomable actions of – a superior civilisation comprising benevolent – or unacknowledging – emissaries from the stars (or extra-dimensions). Dethroned by the return of ancient species, the reawakening of the slumbering Old Ones… Out-competed by the arrival of an invasive species from another world making the Earth just one habitat in a galactic ecology. It could be far into the future or The Day After Tomorrow. Robots may rule the world… not so much enslaving as letting us retire to a life of Fully Automated Luxury Gay Space Communism; life in The Culture as Iain M. Banks foresaw it could be. 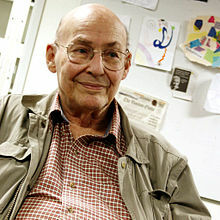 As we stretch our frames, we might spare a thought for Marvin Minsky; he died on this date in 2016. A biochemist and cognitive scientist by training, he was founding director of MIT’s Artificial Intelligence Project (the MIT AI Lab). Minsky authored several widely-used texts, and made many contributions to AI, cognitive psychology, mathematics, computational linguistics, robotics, and optics. He holds several patents, including those for the first neural-network simulator (SNARC, 1951), the first head-mounted graphical display, the first confocal scanning microscope, and the LOGO “turtle” device (with his friend and frequent collaborator Seymour Papert). His other inventions include mechanical hands and the “Muse” synthesizer.